Problem: Neurons are very sensitive to all kinds of chemicals, and need protection from some of the crap that circulates through our blood vessels. Solution: A blood-brain barrier acts as a firewall between the circulation and the brain. Solution: Cytotoxic T lymphocytes constantly survey cells and destroy those that are infected. Problem: Overenthusiastic CTL in the brain cause inflammatory diseases like multiple sclerosis. Solution: Keep them out of the brain as well. Problem: Viruses infect the brain too. Part of the solution is described in a recent paper1 (and I will admit up front that one motivation for talking about this paper is that it gives me an excuse to use the gorgeous image at left,2 which I ran across on Wellcome Images a while ago). But there’s a chicken/egg problem. The CTL look for antigens in the brain, and if they find them, they enter the brain, at which point they can look for antigens in the brain, so that they can enter the brain, where they can look … How do the CTL know that on the other side of that blood-brain barrier, there’s something they’re interested in? 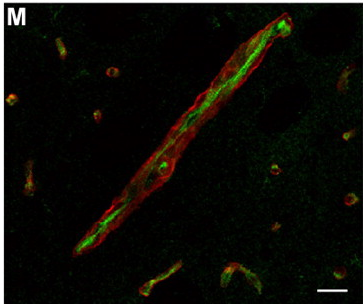 On the blood side of the blood-brain barrier, endothelial cells lining the blood vessel walls express MHC class I (which is, of course, what CTL recognize). 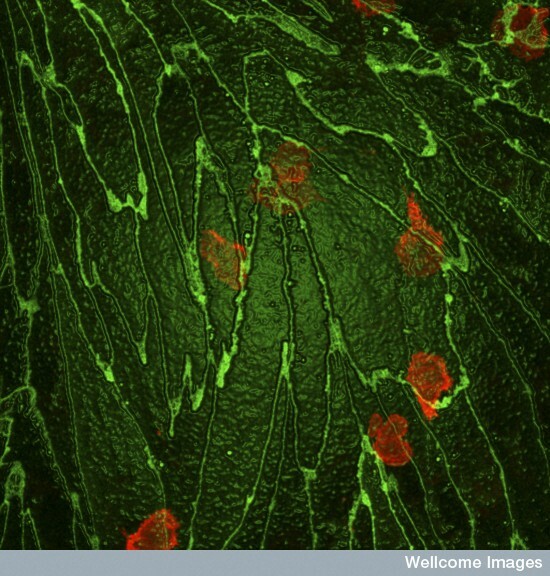 (The figure to the right shows a blood vessel with MHC class I in green, and the basement membrane marker 1-laminin in red.) Blocking this luminal MHC class I reduced the CTL’s ability to enter the brain. “An integral requirement of MHC-dependent CD8 T cell traffic into the brain is the presentation of processed exogenous antigen by MHC class I on the luminal surface of cerebral endothelium.” So, presumably, what’s happening is that the endothelial cells are transmitting the signal across the blood-brain barrier that they form: they take up antigen on the brain side of the blood-brain barrier, process the antigen internally (through some form of cross-presentation), and then push it out on the other side in combination with MHC class I. This has profound therapeutic consequences for neurological diseases mediated by CD8 T cell entry into the CNS such as MS, human T cell lymphotropic virusâ€“associated myelopathy, and various paraneoplastic CNS syndromes, as well as encephalitis and brain tumors. Our description of an antigen-specific pathway for CD8 T cells across the blood-brain barrier means that therapies aimed at blocking/augmenting the MHC-dependent migration of antigen-specific CD8 T cells, as opposed to the whole T cell repertoire, are possible. In other words, where there are brain problems caused by overactive CTL, it may be possible to prevent them from ever entering the brain, perhaps by blocking their MHC class I ligands in the brain blood vessels.